Each participant had three minutes, and one static visual slide, to make a compelling and concise statement about their thesis topic and its significance to society. The departmental event was modeled after the international 3MT®, which was created at the University of Queensland. Since its inaugural event in 2008 it has spread widely and is now held at over 600 universities across more than 65 countries worldwide. The Graduate School at NC State will hold it’s annual 3MT® in the Fall, and the winners of the University-wide event will have the opportunity to progress to the regional competition. Dr. Katie Homar from the Graduate School assisted the department with an informational/preparation session. At a practice session held a week before the competition Drs. Francis de los Reyes, Peter Harries, and Mike Carter offered valuable feedback to the contestants. In addition, the main event featured five judges: Drs. Peter Harries, Meagan Autry and Laura Demarse also from the Graduate School; Matt Shipman, Research News Lead Writer with NC State; and Shelby Hallman, Research Librarian for Engineering and Entrepreneurship. Two finalists and a People’s Choice Award were given. First place went to Ph.D. student Army Lieutenant Colonel Brad McCoy. Second place was awarded to Francisco Jativa. 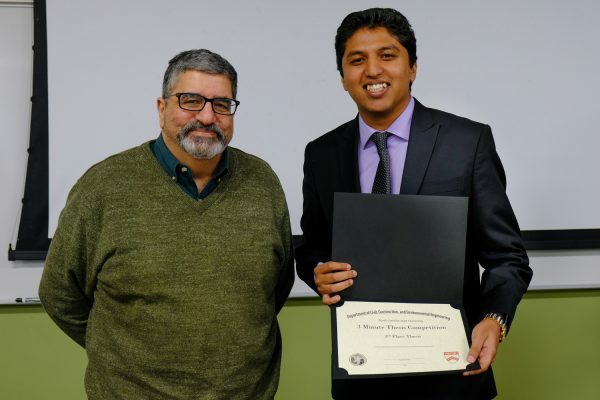 The audience, which included many CCEE faculty and graduate students, voted to bestow the People’s Choice award to Ishtiak Ahmed. L to R Dept. 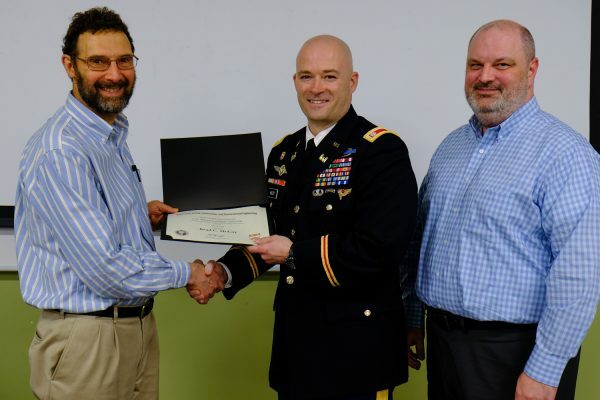 Head Morton Barlaz, Army Lieutenant Colonel and Ph.D. student Brad McCoy, Dr. Rudi Seracino (Advisor to McCoy). McCoy was awarded First Place in the 3MT and also received the C.C. Mangum Inc. Endowment Award. Dept. 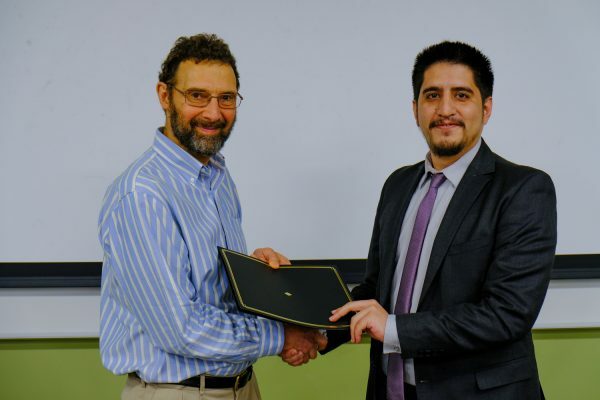 Head Morton Barlaz, left, with Francisco Jativa who won second place in the 3MT. Dr. Nagui Rouphail, left, advisor to Ishtiak Ahmed who was chosen for the People’s Choice Award. The department extends congratulations to all 9 of the participants who worked hard on their presentations. Following is a list of all 9, with their presentation title, and their advisor. We also extend thanks to Drs. Eleni Bardaka, Brina Montoya, and Cassie Castorena for organizing the event, and Dr. Mohammad Pour-Ghaz who acted as the Master of Ceremonies. If you are interested in watching the presentations you can view a compilation here.